Heat oven to 400°F. Lightly spray 9-inch glass pie plate with cooking spray. Sprinkle shrimp and onions in pie plate. In small bowl, mix cheeses; sprinkle 1 cup of the cheese mixture over shrimp and onions. In medium bowl, stir Bisquick mix, eggs, milk and Cajun seasoning with fork or whisk until blended. Pour evenly over cheeses. 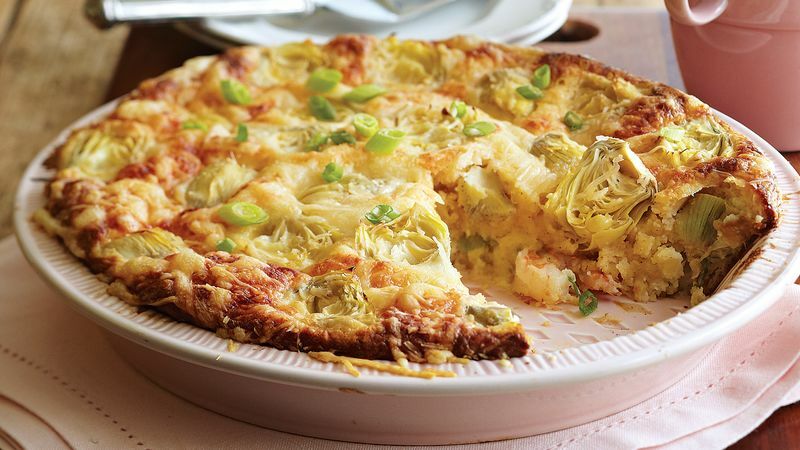 Top with artichoke heart halves, cut sides down, and remaining 1 cup cheese mixture.